Sarasota Dentistry » Blog » How Often Should You Floss? How Often Should You Floss? Why Should You Floss Every Day? Daily flossing disrupts the early plaque colonies every 24 hours preventing the formation of the more destructive tartar. Plaque that forms on the teeth and gums colonizes as bacteria in your mouth that becomes tartar when left unchecked. Tartar formed at the gum line can be compared to a splinter in the skin. The body sees tartar and says, hey, thats not supposed to be there. The result is, just like the splinter in the skin, an inflammatory process begins aimed at removing a substance which is not welcome in the body. It just so happens that this unwanted substance is attached to a tooth. This is the beginning stage of periodontal disease called gingivitis. The good news is its reversible. Without good oral hygiene habits, plaque turns into tartar. Only a professional tooth cleaning can remove tartar from the teeth. Dr. Hank and our team here at Sarasota are always prepared to give patients the precise, thorough teeth cleaning they’ve been missing. Tartar must be removed with special dental instruments designed to remove these stubborn deposits on the tooth surface. Once tartar is removed, it can be kept away by brushing and flossing daily. If a dental cleaning is not performed and inflammation around the tooth is allowed to continue the result is irreversible damage to the surrounding bone holding the tooth in the jaw bone. These early stages of damage to the bone surrounding the teeth are referred to as periodontitis. Periodontitis is divided into mild, moderate, and advanced forms and it can be localized (in one area) or generalized (located throughout an area of the mouth). Recent research suggests that there is a link between gum disease and other systemic diseases such as heart disease, diabetes and cancer. That is a short answer to, Why should you floss your teeth? When plaque and tartar are allowed to build up between the teeth it results in inflamed gums that bleed when during brushing and flossing. When you eat, your gums are stimulated more or less depending on how sharp and crunchy the food is, and the result is bleeding. The key to this is that when your gums bleed, not only does blood come out, but bacteria from your mouth can get into your blood! There are over 300 species of bacteria in the mouth and there are hundreds of thousands of each one. In a healthy mouth that has no bleeding, these bacteria are not able to penetrate the skin of the body. Once the bacteria get into the blood stream, it can travel throughout the body and potential invade other organs or infect the blood vessel. The true scope of this bacterial transfer has not been completely shown — but there have been numerous studies linking oral health to a variety of medical ailments, including heart disease. Dr. Michael and his staff focus on providing painless dental services in a welcoming atmosphere. 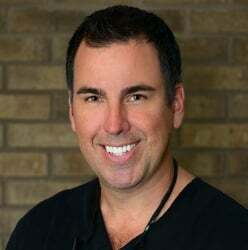 His dental expertise includes general dentistry, dental implants, cosmetic dentistry, oral & I.V. sedation, full mouth reconstruction, teeth bleaching, veneers, laser dentistry, metal-free crowns, inlays/onlays, and dentures to enhance both your health and appearance.